Today's random set is 4539 Manual Level Crossing, released in 1991. It's one of 12 Trains sets produced that year. It contains 110 pieces and 1 minifig, and its retail price was US$25. It's owned by 1606 Brickset members. If you want to add it to your collection you might find it for sale at BrickLink or eBay. I don't think I own this, but I like it. I feel sorry for the signalman. He used to have a balcony, or at least, a little ground level hut, so he could go for a walk or stretch his legs occasionally. Now he needs a ladder work-out just to get into the booth. I honestly thought $25 would get you a little more in 1991. How much would this cost now, I wonder. Excellent, one of my favorites from my childhood. Gold star, Huwbot! completely unrelated but nearly all the Star Wars minifigs have disappeared from the database. Huwbot has killed it the last week or two! Really makes me want to get back into my search for great 80s and 90s sets. Great set! This is incredible! I have 3 of the last 3 random sets of the day (mainly because they aren't clikits). @virgilnz yeah, what in the world? Man, something doesn’t want me to go into that tunnel displayed on the box art. Yikes! Trains! Not sure what else to say. @Virgilnz / The Teenage Brickster: I can confirm this as well, only 10 are shown, all Microfigures from that 2012 board game (3866). 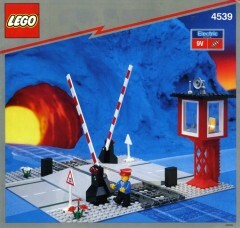 A lovely, quaint little set on the magical and unexplained volcanic blue moon of LEGO trains past. I love the box art on this set. I love that I only just realised that the orange glow is supposed to be a sunset on the other side of the hill, and not a weird glowing cave. I always thought it was a weird glowing cave. Can't understand why they moved away from this style of box art. ^ Some people say sunset, other people say inferno or active volcano. I mean, it was the early 90s. We shouldn't judge. ah, I see we're on the train line that goes to hell again. this service terminates in Pandemonium! Maybe one should create a Clikits train to go with it..? I was hoping for some more train accessories in 2019. Instead, we get more fire, police, and possibly space shuttles. These articles at least kindle my desire to get older sets. Go, Huwbot, go! I ...cross such a crossing everyday but this one definitely looks cleaner than the one I am facing each day!!! I do not understand why LEGO does not do this type of sets anymore. l just imagine that guy sits in the tower all day and when he sees a train he rushes over to the tracks to lower the two gates. I had the 1996 level crossing, which could act as a mini-station. I did own this and it's substance over style, looks too technical and modern, doesn't really fit the yellow train station. Still, it was good to have and was essential for my town layout. Remember, if the crossing gates are up, the volcano is active. If they are down the volcano has gone dormant long enough for the train to pass through. LEGO science! A Level Crossing with a Baseplate (!!). Why Lego, why is this today not possible to produce? This looks OK, but would be waaaaay better if you could put it on your arm and action-blast at microscale. Plus, not nearly enough stickers to coincide with my political and religious views. Again, I've always wondered why Lego has deviated from the same type of offerings as companies such as Marklin, Lionel, or Bachmann; to standalone sets, with little extra stuff for expansion. While expensive (even for the nineties), it's a very nice set. 12 Train sets produced that year. It be amazing if we got 12 Train sets in the last decade. Sweet Christmas, these would sell like, like... well... like Lego if available today.